When All Aboard Florida, a subsidiary of Florida East Coast Industries, revealed plans for high-speed passenger train service from Miami to Orlando, opponents raised many concerns. Now that its trains are on track, literally, the Treasure Coast hopes to convince the company to add a stop closer to home. Both Fort Pierce and Stuart have submitted proposals. The trains will be zipping their way through Treasure Coast counties regardless, but adding a stop is certain to positively impact whichever city is selected. Brightline, the express passenger-rail company operated by All Aboard Florida, made a major announcement in November that it is changing its brand name to Virgin Trains USA after a new partnership with the Virgin Group, formed by British business magnate Sir Richard Branson. The Virgin Group becomes a minority investor in Brightline, which remains under current management and ownership while the Virgin Trains USA name eventually begins appearing in ads, on trains and at stations. Earlier that same month, Brightline had invited representatives from Fort Pierce to ride from its West Palm Beach station to Miami and back. 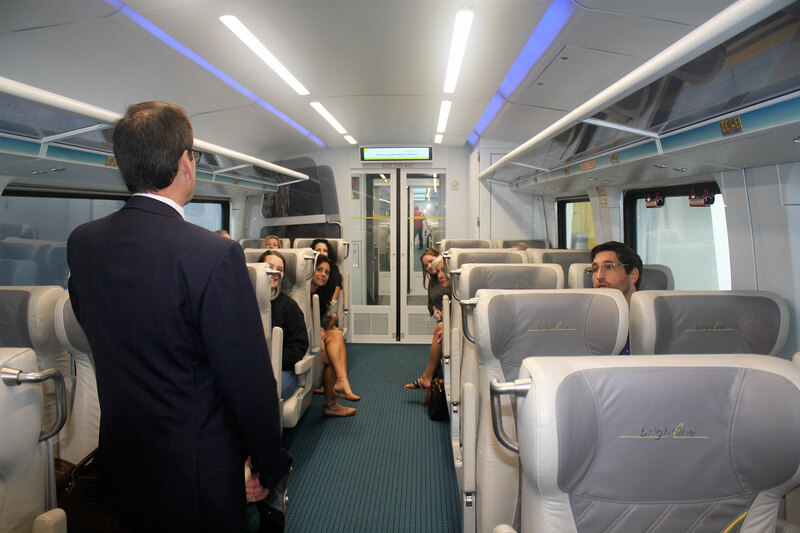 Fourteen men and women affiliated with either Main Street Fort Pierce or a downtown business were treated to the rail system’s experience. As I drove to meet my group downtown for the drive to West Palm Beach, I waited on a freight train crossing Avenue A, one of the concerns for increased trains locally. However, traffic can use either the Citrus Avenue overpass or the A.E. Backus Drive underpass to avoid waiting. On the ride south, it was apparent that — as pleasant as the trip was so far, chatting about local issues — catching a train on the Treasure Coast could only improve matters. No longer needing to negotiate Miami traffic is great, but eliminating the drive to West Palm’s station? Better still. Our first stop was Park-Line, the rail system’s parking garage that also houses 290 apartments. We were greeted by Rusty Roberts, vice-president of government affairs, who explained general information, fielded questions, and handed out reserved seating tickets. Passengers can either scan paper tickets or download the Brightline/Virgin Trains USA app and scan ticket information from a device. Any mass transit system needs good security, but Brightline made sure it was streamlined. Less invasive and time-consuming than at an airport, the process moves passengers along quickly using the latest technology. Our group breezed through, stopping to take a look at the gift shop and snack area before waiting to board in the Select lounge. Select is the company’s equivalent of First Class. Select passengers are treated to a separate waiting area with complimentary snacks and beverages; they also may board first. Select seats on the train are wider, with limited seating in a single row for folks wanting additional elbow room. Round-trip Select tickets from West Palm Beach to Miami are $35 to $40, with free parking and more complimentary snacks and beverages (a wide range, including alcohol) on board. Smart Plus passengers pay $24 to $27. Reclining seats are 19 inches wide and include a four-seat table option as opposed to the standard pull-down tray table, an arrangement well-suited for group conversation, meetings or a working commute. The price includes one complimentary snack and beverage on board with low-cost parking. Smart passengers pay $17 to $20, plus low-cost parking if needed; beverages and snacks are available for purchase either at the station or on board (cashless only). Passengers may also bring their own snacks and non-alcoholic beverages. All passengers may check luggage or use the spacious storage areas. Seats feature charging stations; Wi-Fi is free. Bike racks and pet carriers are available. Brightline became the first and only fully wheelchair-accessible system from station to train, using a unique level boarding feature and wide aisles throughout. In the bathrooms, Dyson touchless technology provides hands-free flushing, water, soap and drying. Miami-Orlando route is 30 to 36 months. The ticket price hasn’t been set yet, but the Orlando Airport station is nearly complete. Miami’s station contains restaurants, shopping, and connections to other forms of mass transit. When we walked outside to take in its enormity, we saw a nearby lot that will be the home of a 1,700-room Marriott. Would a hotel as part of a station in Fort Pierce or Stuart be a possibility? At the Miami Select lounge, CEO Chris Sariego asked for recommendations of places to stay and things to do when he visits the Treasure Coast, part of the decision-making process of choosing a station. Daily, including holidays, Brightline/Virgin Trains USA currently makes 16 northbound trips and 16 southbound trips. It is the only privately owned, operated, and maintained passenger train system in the United States, using American-made products whenever possible. Jacksonville and Tampa routes are in discussion for future expansion. Why trains? At one time, train travel was the most widely used mode of transportation. With the advent of affordable cars, then airplanes, it declined. Today, there is much to be said for Virgin Trains USA’s “carefree, car-free” travel. Less time in traffic can mean less stress. Fewer cars on the road reduces greenhouse gas emissions. A relaxed method of moving from point A to point B adds hours to the day, better spent than fuming at long lights, construction delays, or inconsiderate drivers. Prior travel on passenger trains didn’t prepare me for the hospitality-focused Brightline/Virgin Trains USA experience. Clean, modern, and comfortable, everything about the trip said “excellence,” and said it with a smile. Main Street treasurer Dave Miller summed up the group’s response with an accountant’s precision: “I want it.” Many people in other cities along the Treasure Coast are saying the same thing.